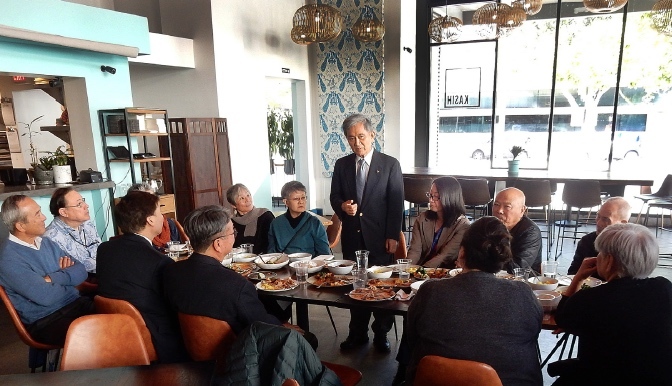 Toshio “Terry” Handa says farewell at a luncheon last week in his honor at Kasih restaurant in Little Tokyo. Handa and his wife Toshiko are moving back to Japan, after four decades living in the United States. Handa has been active in the local Japanese community as a participant in numerous organizations, including Japanese Community Pioneer Center, Chado Urasenke Tankokai Orange County Association, Japanese American Cultural & Community Center, Little Tokyo Community Council, and Japanese Prefectural Association of Southern California. He received the Commendation of the Consul General of Japan in Los Angeles in spring 2014. He is also a regular contributor to the “Jishin” column in the Japanese section of The Rafu, which he said he will continue.